Cloudburst Cascade Seafoam from Firespiral Slings is a blend of 59% cotton, 33% linen & 8% viscose. It's about 250 GSM making it a medium weight wrap. It's woven using Firespiral's Alchemy Weave which is slightly looser and makes for lovely soft & mouldable wraps. Well, the name's certainly apt with the weather we've been enjoying this week! Luckily the sun turning red didn't in fact herald the apocalypse, so we took the opportunity to take Cloudburst for some walks, breathe in the southern non-hurricane force winds and marvel at the Gods randomly emptying their bath water on us! Even in the 'end of days' light, Cloudburst glowed, saturated in rich, deep colour. Cloudburst is the second wrap on the Cascade warp I've had the pleasure of testing, the first being SETI Cascade Starmap. The Cascade warp is a beautiful variegated deep turquoise and smokey grey (with a hint of purple) pinstripe, while the Cloudburst weft is made up of two different yarns creating an indigo blue. The blue adds depth to the Cascade colour and makes for a stunning, almost moody colour combination that's perfect for the Seafoam design. Cloudburst would make a great 'jeans wrap' but also looks very special if you have a more formal occasion coming up. I've had the pleasure of owning or reviewing several of Firespiral's Seafoams and I love the way they look. The design captures the natural movement of the ocean and seashore more than any other design I've seen. It looks stunning wrapped and always gives two contrasting faces or sides. In hand, Cloudburst feels fairly light, and very floppy. When I took it out of the package, Cloudburst virtually flowed out, pooling on the floor in a puddle of delicious fabric. There's a contrast between the silky smooth soft Cascade warp face and the fine, slightly rougher, texture created by the two different threads in the weft. Cloudburst is very easy to wrap with being super mouldable with quite a lot of stretch. Fans of Firespiral's 'old school' thin linen blends (e.g. Gamma, Bronze, ETG...) will recognise the bandage like wrapping qualities, whilst enjoying a smidgen more thickness. It's fair to say that Cloudburst has all the qualities I love in a wrap for a smaller wrappee, but Cloudburst isn't only for the tiny ones. My littlest is getting less little by the minute (eight months old now - how did that happen?! ), and has lead for bones like his brother! He's getting a bit heavy to carry on my front for our walks now, but I'm clinging onto the opportunities while I can! I can honestly say however that I was completely comfortable with him on my front in Cloudburst in a FWCC for over an hour of walking. 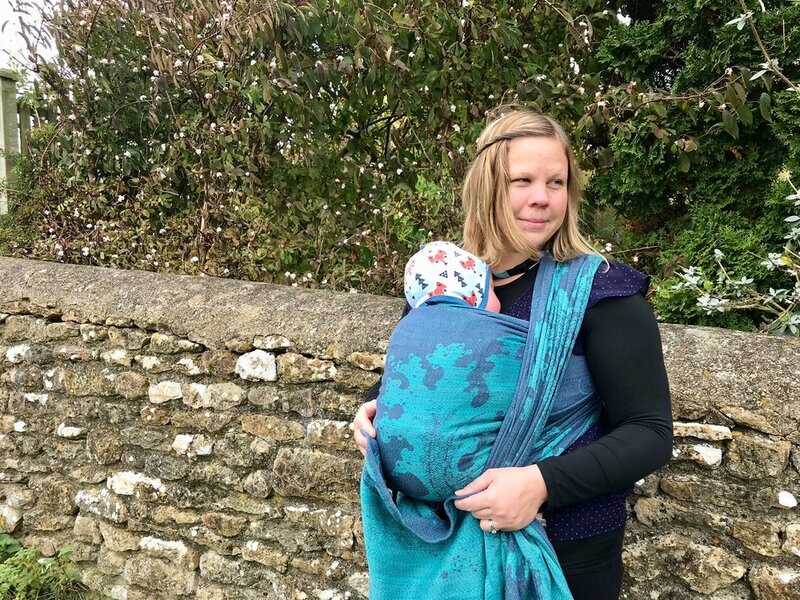 While I'd choose the cushiness, strength and weight of SETI to carry my toddler, Cloudburst is a great wrap for those who prefer a lovely floppy, mouldable, medium weight. I generally find the Seafoam design to be on the less grippy side, but the two yarns in Cloudburst's weft create a fine texture and sufficient grip to hold everything in place. There was no slippage despite me jogging down a hill to intercept my toddler who was enthusiastically heading for an electric fence! Cloudburst is very easy care and can be washed and tumble dried. The beautiful Seafoam design can be prone to pulls, but they're easy to fix so not a cause for worry. Cloudburst may share a warp and a similar blend with SETI, but they're very different wraps. Lighter and thinner than SETI, Cloudburst is soft and extremely mouldable with considerable diagonal stretch. Whereas SETI is a cushy toddler prison, Cloudburst wraps like a bandage, making it perfect for newborns and younger babies. Cloudburst isn't all about the teeny ones though. The linen adds a bit of oomph, making it strong enough to carry a heavier wrappee in multi-layer carries. Cloudburst would make an ideal wrap for a novice wrapper and a stunning all seasons addition to any stash. Cloudburst Cascade Seafoam will be released on 28th October and available to buy from the Firespiral Slings website. I recommend following them on Facebook for all their news and details of upcoming releases.